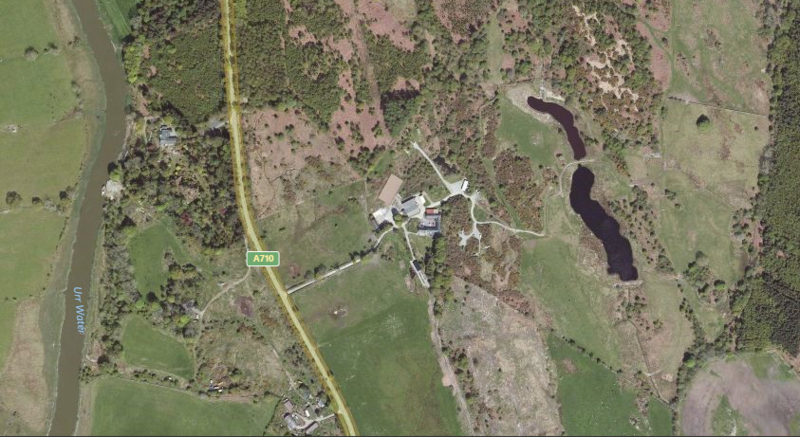 We are located off the A710 Coast Road, approx 2 miles south of Dalbeattie SW Scotland. Travelling from Carlisle and the south: Take the M6/M74 to Gretna (6 miles) and, just over the border, turn off onto the A75 signposted Dumfries and Stranraer. Stay on the A75 to Dumfries (32 miles) and remain on the A75 towards Stranraer. At the 6th roundabout, take the first left signposted A711 Dalbeattie. Turn onto the A711 at Cargenbridge and follow the road all the way to Dalbeattie (14 miles). At Dalbeattie, drive through the town past the petrol station, police station and church on the left and take the Coast Road A710 on the left just before leaving Dalbeattie. Follow the road past housing and the Dalbeattie Forest on the left. Greenhill Farm & Fishery / Gorsebank Glamping Village is on the left a few miles past the forest. Travelling from Stranraer: Take the A75 all the way to Castle Douglas. Drive through the town to the roundabout by Tesco supermarket and take the Dalbeattie turning A711. Following the A711 all the way to Dalbeattie. As you enter Dalbeattie, take the first right onto the A710 Coast Road past housing and the Dalbeattie Forest on the left. Greenhill Farm & Fishery / Gorsebank Glamping Village is on the left a few miles past the forest. Travelling from Ayr: Take the A713 Castle Douglas road from Ayr through Dalmellington and Carsphairn until to reach Castle Douglas. Drive through the town to the roundabout by Tesco supermarket and take the Dalbeattie turning A711. Following the A711 all the way to Dalbeattie. As you enter Dalbeattie, take the first right onto the A710 Coast Road past housing and the Dalbeattie Forest on the left. Greenhill Farm & Fishery / Gorsebank Glamping Village is on the left a few miles past the forest. Travelling from the Central Belt: Take the M74 and exit at Beattock (signposted Dumfries). Drive through Locharbriggs and Heatthall and turn right at the roundabout by the petrol station and right at the next roundabout where you join the A75. Stay on the A75 towards Stranraer through two further roundabouts and exit first left at the third signposted A711 Dalbeattie. Turn onto the A711 at Cargenbridge and follow the road all the way to Dalbeattie (14 miles). At Dalbeattie, drive through the town past the petrol station, police station and church on the left and take the Coast Road A710 on the left just before leaving Dalbeattie. Follow the road past housing and the Dalbeattie Forest on the left. Greenhill Farm & Fishery / Gorsebank Glamping Village is on the left a few miles past the forest. We look forward to welcoming you to Greenhill Fishery soon!